How Do I Pay My Medical Bills After A Semi-Truck Accident? 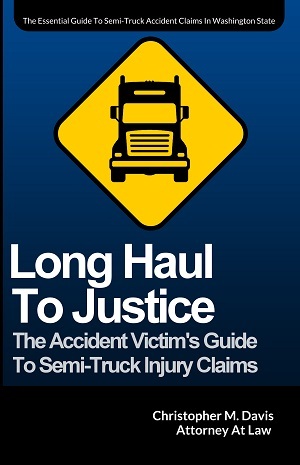 Victims involved in semi-truck accidents have often suffered serious and life-changing injuries. The victim and their family is often wondering, “I wasn’t at fault in this crash, so who’s going to pay my medical bills?” The answer isn’t always simple. If you’ve been involved in a semi-truck accident caused by the negligence or fault of another person, the most important thing you can do is get medical treatment immediately. One of the most common ways that insurance companies diminish the value of a claim is to use the injured person’s own medical records against them. Their logic: If you didn’t get treatment, the injury must not have been that severe. The attorneys at Seattle-based Davis Law Group, P.S., have handled cases against trucking companies for over 20 years. In most cases, a personal injury claim can be filed against the trucking carrier (usually covered by their insurance company) to pay for your reasonable and necessary medical treatment. Trucking companies and their insurance providers won’t pay your medical bills as they come due. Instead, the trucking company’s insurance will pay for your medical treatment in a settlement or trial verdict. Unfortunately, cases against trucking companies can sometimes take years to settle, leaving victims in a bind. Will My Attorney Pay My Semi Truck Medical Bills? Your attorney is not allowed to pay for your medical treatment. But your attorney can help establish medical liens or deferred payment for your healthcare providers. Ask your attorney about negotiating medical liens or deferred payment on your behalf. Can I Use My Own Health Insurance To Pay Bills? Upon arrival at the hospital after a semi-truck crash, provide them with your medical card and have them bill your health insurance. Most health insurance plans are required to pay for your medical care regardless whether a crash was the cause of your injuries. Your health insurance company will want to be reimbursed for what they paid from your settlement or jury verdict. This process is called subrogation. An experienced semi-truck attorney can take care of this. What If I Have Automobile Insurance With PIP Coverage? Personal Injury Protection (PIP) insurance is automobile insurance coverage which will pay your medical bills, wage loss, or funeral expenses following a car accident. PIP coverage pays for expenses up the coverage amount regardless of fault. If you have an automobile insurance policy that includes PIP coverage, your insurance company should cover the medical bills you incur up to the limits outlined in your policy. If you don’t have health insurance, make sure that you get it. Most people don’t expect to need the financial protection, but are glad they had it when life happens. If you are suddenly facing a mountain of medical bills after a serious semi-truck accident, contact the trucking accident attorneys at Davis Law Group. Call (206) 727-4000 to schedule a free case evaluation. ?How Do I Find The Right Semi-Truck Accident Attorney? ?How Much Does It Cost To Hire A Semi-Truck Accident Lawyer? ?How Do I Pay My Medical Bills After A Semi-Truck Accident?